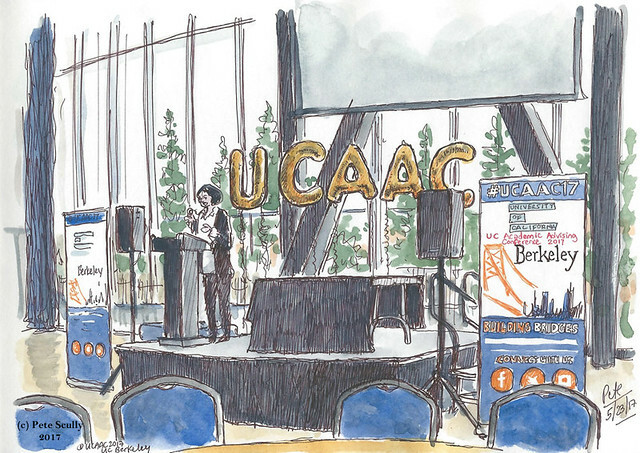 Recently I went to Berkeley for the annual UC Academic Advising Conference (UCAAC). I’ve been going to this conference most years since 2007, which was hosted by UC Irvine at the Disneyland Hotel. Each year a different UC campus hosts the conference and this year Berkeley got the chance. I sketched the opening remarks at the morning breakfast, before the break-out workshops began (fun note: I won a Starbucks gift card for this sketch!). The theme this year was ‘Building Bridges’, because, as you know, lots of bridges near here. The Bay Bridge, the Golden Gate Bridge, the Carquinas Bridge, loads of bridges. But yes, yes I kept thinking if Ian McKellen’s Magneto delivering his Magnetoesque line from X-Men: The Last Stand: “Charles always wanted to build bridges.” He said that as you know just after ripping the Golden Gate Bridge from its base and dumping it on Alcatraz for some reason. I love Magneto. 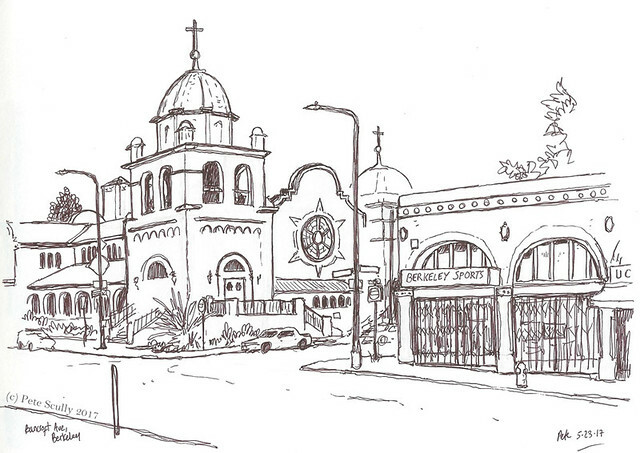 This sketch of Bancroft Avenue was drawn early in the morning, after getting off the train. 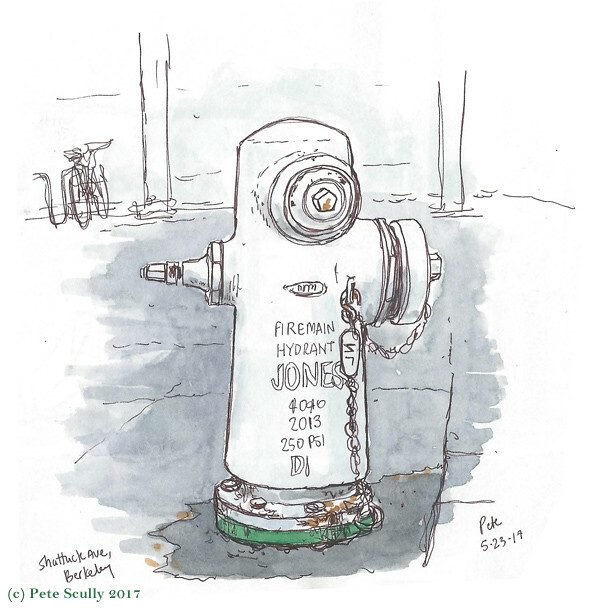 There is always a lot to sketch in Berkeley. Such as Sather Gate. 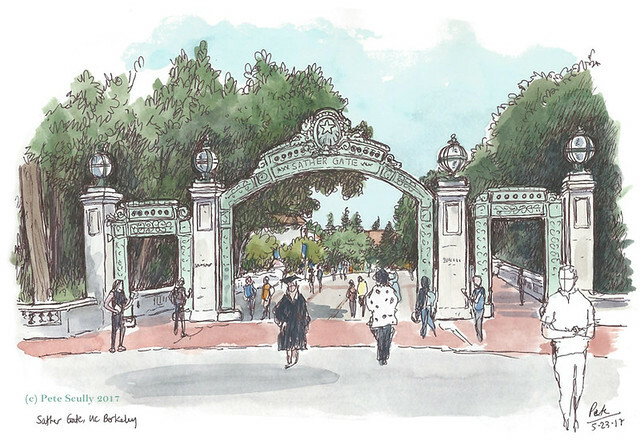 This is a very ornate gateway on campus, and I did draw it many years ago, but wasn’t happy with it at the time, so I’m pleased to report, I like the newer version. There were quite a few students in graduation garb walking around taking photos, as you do. It was that time of year. 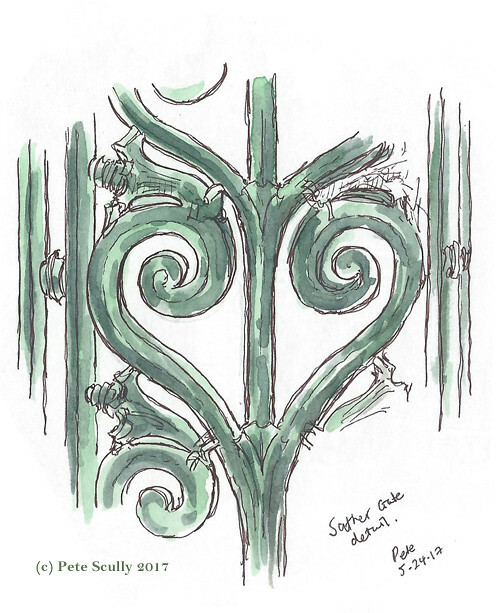 Below, I drew a detail of the gate. Making a heart. I did those between workshops, but I also did a bit of sketching after the final workshop on day two, when I wandered campus a bit after lunch. Below is the University Library, which is just a massive, grandiose epic structure. 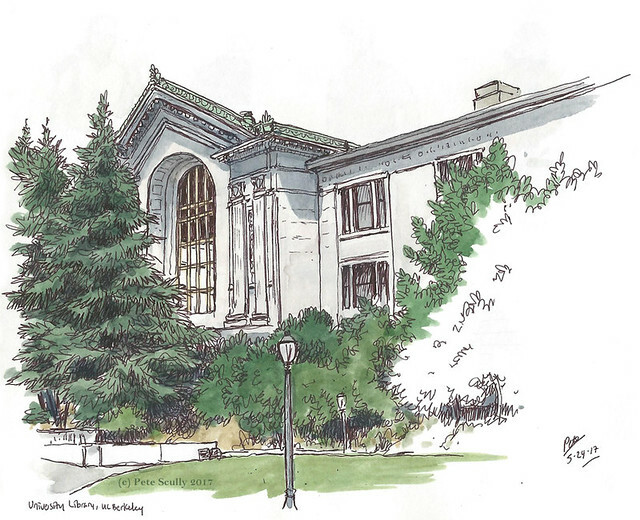 A lot of UC Berkeley is like this, full of grandeur, far more than UC Davis. 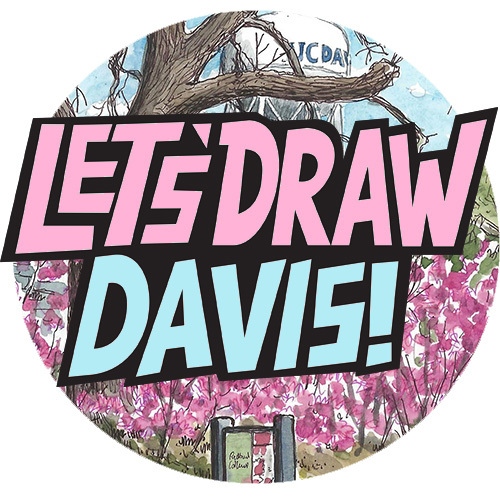 Berkeley is Davis’s parent school of course, with UC Davis being founded as Berkeley’s offshoot University Farm. Our library is also massive, but this one looks far grander. 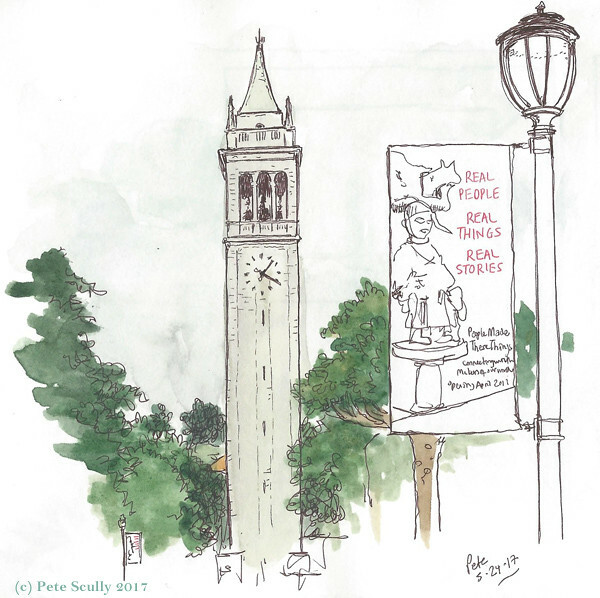 Below is the Sather Tower, the large campanile (bell-tower) at the heart of the Berkeley campus. It’s nice up the top of there by the way. I just had to draw it again. And the fire hydrants. 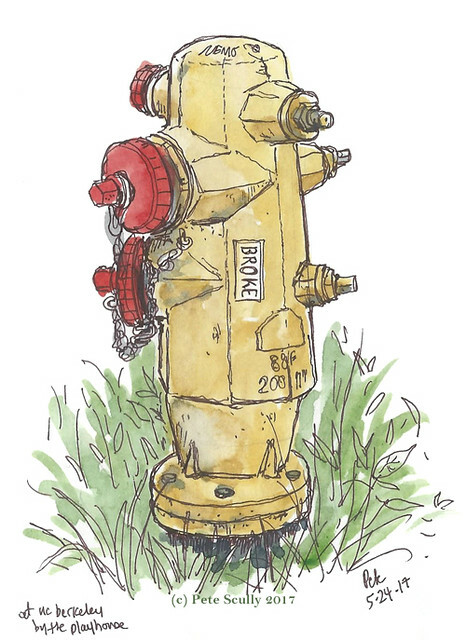 Like in Davis, the city has a different colour hydrant from the campus, but unlike Davis, it’s the campus that has the yellow hydrants while the city has the white ones. I know! You don’t care! But I think that is funny. The yellow one there is outside the Playhouse on campus, while the short white one is on Shattuck Avenue next to that discount bookstore.